This was a real favorite when I was a kid (yes, they had Fritos back then), and it still is. 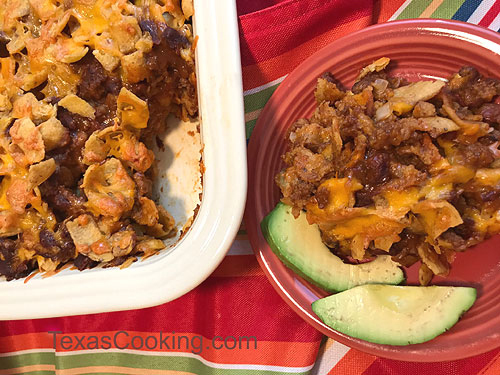 With the Frito-Lay Company being based in Dallas, this dish is about as Texan as you can get. The recipe, as written here, is perfect for a 9x9-inch dish. But for a crowd or, even better, tailgating, double the recipe and bake it in a 9x13-inch dish. Cover the hot dish well with aluminum foil to keep it warm or use an insulated carrier. Perfect for game day and a Super Bowl crowd, too! Spread 2 cups of Fritos in a baking dish (an 8x8- or 9x9-inch dish works great -- double the recipe for a 9x13-inch dish). Sprinkle half the onion and half the cheese over the Fritos. Warm up the chili in a small saucepan. Then pour the chili over the onion and cheese. Sprinkle the remaining Fritos, onion and cheese over the chili. Bake for about 20 minutes until heated through and cheese is bubbly. Serve hot.